Philippine President Rodrigo Duterte and Malaysian Prime Minister Najib Razak made high-profile visits to China from October 18-21 and from October 31 to November 5, 2016, respectively. It was the first China visit for Duterte since he took office about four months earlier (his first trip outside of ASEAN), and the third for Najib as premier since 2009. Both visits sparked concerns that have grown after Donald Trump’s surprise triumph on November 8. Is the United States losing to China in the long-term geopolitical competition in Southeast Asia? Are more smaller states in Asia tilting toward China for economic benefits at the expense of US interests? Is the continuing uncertainty surrounding Trump’s external policies (particularly on China, US-Asian alliances, and the TPP) creating more room for China to expand its influence in Asia? These questions are misleading because of their zero-sum, dichotomous assumptions; however, the issue of small-state “realignment” in Asia, as highlighted by mounting concerns in and out of the region, is real. Regional states’ strategic “reorientations” will have an impact on the power order in the Asia Pacific. If countries, especially those perceived by Beijing as within its “traditional” sphere of influence, are “shifting” their external priorities one after another in embracing China’s geo-economic and geostrategic designs under President Xi Jinping’s One Belt, One Road Initiative, the developments may signify the reemergence of the Sino-centered order.1 Are the two leaders’ visits an early sign of such a trend? We contend that it is still early to draw such a conclusion, as the visits underscore more recurring themes than new trends. They signify greater readiness on the part of smaller countries to move closer to Beijing; however, this is more a calculation of self-interest in the face of fast-changing, uncertain, external and internal conditions than a demonstration of strategic choice to side with the proximate giant. The direction of alignment decisions will depend especially on three factors: China’s actions, Trump’s Asia policy, and the actions and reactions between the two giants. The top-down effects of these interactions will then be filtered by domestic conditions, prompting states to respond in ways that serve their own ruling elites’ internal agenda. If Trump’s telephone conversation with Taiwanese President Tsai Ing-wen on December 2 was indeed “planned in advance to signal a new, robust approach to relations with China” as reported,2 this may signal more turbulent US-China relations ahead with growing uncertainty that continues to make any clear-cut alignment choice on the part of smaller states unlikely. Both Duterte and Najib’s China visits were driven primarily by their own domestic political needs and calculations. Domestic political imperative filters judgments about the relative utilities and drawbacks of adjusting relations with the major powers, e.g. from siding with one power to a more balanced relationship with all big powers, from close cooperation to even closer partnerships in all domains with the power(s) that matter. Whatever the pattern of relations—close, distanced, and/or selectively confrontational on certain or all domains—the desired benefits will always come together with some undesirable, but inevitable downsides, costs, and risks, as in all policy processes. The drawbacks will be seen as “acceptable” tradeoffs, so long as the adjusted relations promise ruling elites greater utilities needed at home. What benefits does Duterte target from his visit to China (and rebalanced relations with the big powers)? Economic benefits clearly top the list. He returned home with USD 24 billion in deals, which boost Philippines’ public infrastructure and a range of other sectors. There is a wider geopolitical rationale as well. Duterte obviously wants to find a way out from the stalemate in the South China Sea, in order to concentrate on domestic development. He also wants to reduce his country’s dependence on the United States and steer a more independent foreign policy. These multiple targeted benefits must be seen as the parallel, integral instruments of the new leader’s domestic agenda. That is, to pursue policies along the very political pathways that brought him from the southern city of Davao (as a seven-term mayor) to the Malacanang Palace, with the ambition of transforming Philippine politics, and, as one analyst puts it, “uplifting the lives of the vast majority [of] Filipinos who have long been denied economic development opportunities.”3 These aspirations require him to carry out the type of populist, mass-oriented policies that earned him high support in Davao and policies that he pledged to the electorate, who yearned for change. Chief among these policies are tackling the country’s drug, crime, and corruption problems, improving its infrastructure, and reaching peace agreements with the communist insurgents and Moro separatists in the south, but also managing the maritime disputes peacefully. These are all essential to attain Duterte’s ambition of ending the elite-based, Manila-centered old politics, while creating more equally distributed developmental fruits to the majority of his people in a safe, peaceful environment. These domestic needs push Duterte to view China as the indispensable source of external assistance. Beijing’s responses before, during, and after his visits justify his conciliatory approach, thereby resetting bilateral relations and ending the years-long antagonism under Benigno Aquino III (2010-2016). China has enthusiastically backed Duterte’s drug war, pledged the much-needed investments and know-how to revamp the country’s infrastructure, and reciprocated the leader’s good will over the South China Sea by quietly allowing Filipino fishermen to return to Scarborough Shoal for the first time in four years. Najib’s week-long trip to China and his evolving big power policy is similarly driven by domestic political necessity, especially economic gains, by securing investments that can boost Malaysia’s flagging economy (deals worth USD 33 billion were signed during the visit). Like Duterte, Najib also went to Beijing with Washington in mind (while there, he wrote an editorial in a state-run Chinese newspaper warning “former colonial powers” to stop interfering in the internal affairs of smaller countries). Small-state pragmatism aside, Najib’s visit was also colored by his battle for survival at home. The ruling Barisan Nasional (BN) coalition—of which Najib’s United Malays National Organisation (UMNO) is the dominant party—has faced unprecedented challenges in recent years. After BN’s setback in the 2013 general elections, where it again lost its two-thirds majority in the Parliament and lost several states to the opposition (after the first such setback in 2008) due to a major swing in the urban electorate, UMNO has increasingly turned to race and religion to consolidate its rural Malay-Muslim base. Identity conservatism alone, however, may not be a sufficient platform to win the election, which is due in mid 2018, but can be held as early as 2017. Economic performance is another pathway to hold on to power. Ensuring growth has long remained a key source of legitimacy for BN to appeal to the non-Malays and the urban-based, moderate-inclined Malay voters. It is also a basic element of UMNO’s increasingly patronage-based politics. Economic pragmatism, by extension, is a pillar of Malaysia’s external policy, especially towards China, its largest trading partner since 2009 (and Malaysia is China’s largest trading partner in ASEAN, and the third in Asia, after Japan and South Korea). Under Najib, economic pragmatism vis-à-vis China has gained more salience. In addition to promoting bilateral trade, his administration has taken concerted efforts to attract more investment while exploring new commercial ventures: developing the Twin Industrial Parks in Guangxi’s Qinzhou and Pahang’s Kuantan, enhancing currency and financial cooperation, as well as attracting China’s leading MNCs in telecommunication, railways, and other key sectors to make Malaysia their base in the ASEAN region. China’s telecommunications giant Huawei’s Global Training Center in Putrajaya is the first of its kind outside of China. CSR‘s center in Batu Gajah to produce locomotives is China’s first overseas base to manufacture railway equipment (ventures initiated well before the launching of Xi’s One Belt, One Road initiative). Over the past two years, the Najib government has stepped up its efforts to attract capital and technology from China as Malaysia faces sharply declining foreign investment, increasing capital outflows, sliding commodity prices, and a depreciating currency. The sharp drop in oil prices has posed a serious problem, as energy accounts for about 20 percent of the country’s GDP. While Malaysia tries to diversify its economic links (joining the TPP, exploring a FTA with the EU, and taking part in RCEP), developing an even closer economic partnership with China had emerged as a key component of Najib’s external economic strategy by the mid-2010s. Defense has long been an underdeveloped area of Malaysia-China relations. In addition to the “landmark decision” (Najib’s own words) to purchase the LMSs, the country’s first significant defense deal with China, Malaysia has agreed to forge naval cooperation with China in the politically sensitive South China Sea, as stated in an MoU signed on November 1, 2016.18 Malaysia’s decisions on the LMSs and naval cooperation should not be seen as isolated developments, but part of ongoing strategic recalibration that has gained momentum, with implications for the country’s long-term security posture.19 In 2013, Malaysia and China upgraded their bilateral ties to a “comprehensive strategic partnership.” In 2014, the two militaries conducted a joint table-top exercise (TTX). In 2015, the two held their first ever joint live-troop exercise in the Strait of Malacca (the largest ever drill between China and an ASEAN country). This year, the two armed forces conducted their second joint live-troop military exercises code-named Aman Youyi (“Aman” means “Peace” in Malay, whereas “Youyi” means “Friendship” in Chinese) in Paya Indah, Selangor from November 21-25, about two weeks after Najib’s China visit, with ten observers from the Thai military, led by a two-star general. Malaysia proposed to expand from bilateral to trilateral exercises in 2017.20 These developments notwithstanding, there is still a big gap between Malaysia-China defense ties and the Malaysia-US defense partnership. The two leaders’ high-profile visits have attracted much attention, leading to half-truths and misinterpretations in many commentaries. Three are widespread. Misinterpretation 2: The statements made by the two leaders during the visits indicate that these states have chosen to downgrade their US ties. Misinterpretation 3: Because of growing reliance on China, the Philippines, and Malaysia, both claimant countries of the South China Sea, are compromising their interests in the disputed areas and, possibly, on other issues as well. It is premature to judge whether China’s economic inducements have already eroded the smaller states’ autonomy, compelling them to surrender their interests in the South China Sea. Both leaders have insisted to the contrary. Duterte declared: “We will stick to our claim. We do not bargain anything there. We continue to insist what is ours.”31 Having emphasized his stance, the leader talked about his preferred approach to manage the disputes, “There is no sense in going to war. There is no sense fighting over a body of water.” He added, “It is better to talk than war. We want to talk about friendship, we want to talk about cooperation and most of all, we want to talk about business.”32 Najib similarly stressed, “Malaysia would not compromise on its South China Sea claims, but wants them to be worked out through dialogue and peaceful negotiations.”33 Malaysia’s South China Sea policy has long been sustained by the following thrusts: exercise of sovereign rights, insistence on dialogue and peaceful means, avoidance of confrontation, emphasis on international law, and limited alignment.34 Each of these thrusts has been in place before Najib came to power; none of them has been given up after Najib’s visit to China. The leaders’ China visits reflect themes typical of weaker states’ alignment behavior under uncertainty. Four are the most vital, likely to endure well into the Trump era. First, power asymmetry compels pragmatism; growing asymmetry compels growing pragmatism, albeit almost always in an ambivalent manner.35 Smaller states’ leaders realize that major powers like China (and also the United States) could help and harm them much more than all other actors, and in more than one realm. They realize that the big powers present them indispensable assistance and opportunities in certain domains, but pose challenges in others. Pragmatic recognition of such ambivalent realities drive—and limit—their policies towards the major powers, as in bringing the leaders to China for maximizing benefits, while seeking to mitigate certain risks. Great-power relations have become even more uncertain under Trump. The structural reality of enduring uncertainty has profound implications for regional states’ alignment decisions. Because of the high stakes and uncertainties in great power politics, the Philippines and Malaysia—like other weaker states in Asia—are keeping their options open. While Duterte and Najib have moved closer to China, they did not severe their long-standing strategic links and multi-front cooperation with their traditional partners. Duterte and Najib may not be pro-China or pro-anyone but mainly prioritize their own domestic political interests. Third, domestic politics dictate the substance of small-state alignment behavior. The ruling elites’ respective judgments on how best to conceive, cultivate, and capitalize on external conditions for justifying and consolidating their own domestic authority determine a state’s alignment choices.39 These choices include: how close (or distant) should a state position itself toward a big power (or any external actor), to what extent should one cooperate with (or confront against) the power, for what prioritized benefits, and over what (politically acceptable) price. Duterte and Najib’s China visits and their overall big power policies should be seen in this context. Fourth, when domestic conditions are complex and the external power structure uncertain, ambiguity in small-state strategy is a necessity. It is often manifest in multiple mutually complementary, competing, and even contradictory approaches, distinct from single-directional, straightforward strategies like hard-balancing (e.g. a full-fledged alliance with the US to check a military threat, the approach adopted by Aquino III) or complete bandwagoning (e.g. fully joining the China camp for benefits—a near example being Hun Sen’s Cambodia).40 Although those clear-cut strategies may bring benefits (e.g. maximizing security and/or prosperity), they incur external and internal costs (alienating the opposing power, eroding domestic authority, undermining autonomy), which may not be acceptable to certain ruling elites, depending on the sources of their power at home. Such tradeoffs are a non-starter for both Duterte and Najib; hence their rejections of the straightforward strategies. In the case of Malaysia, Najib’s policy is similarly working with, rather than confronting, the source of security risks. As opined by one former senior diplomat, “Malaysia has a unique approach in dealing with perceived problems and risks. Instead of distancing or confronting the source of dangers, we opt to engage, cooperate, and integrate them within a wider interactive process. [In so doing] we transform the potentially problematic relations by working together, by becoming partners, and by jointly managing common concerns, thereby continuously creating a sense of closeness, avoiding conflicts, and making cooperation as the main thrust of the relationship. This process may help us to neutralize potential dangers over the long run.”42 More comparative research should be undertaken to examine more systematically the manifestations, conditions, and factors driving small states’ deliberately ambiguous and counter-intuitive approaches vis-à-vis the competing powers. 1. Euan Graham, “Dominoes in the South China Sea,” The Wall Street Journal, November 1, 2016; “US allies are buddying up with the authoritarians in Beijing,” The Washington Post, November 4, 2016; “How Donald Trump Changed Asia’s Relationship with Washington,” http://fortune.com/2016/11/08/donald-trump-election-asia-china-tpp/. On a State Department interpretation of the “realignment,” see Curtis Stone, “State spokesman struggles with facts: As the US pivots to Asia, the region turns to China,” People’s Daily Online, http://en.people.cn/n3/2016/1103/c90000-9136866.html. 2. Anne Gearan, Philip Rucker, and Simon Denyer. “Trump’s Taiwan phone call was long planned, say people who were involved,” The Washington Post, December 5, 2016. 4. Allan Nawal, “Duterte tells US, other critics to stop the hypocrisy,” Philippine Daily Inquirer, September 30, 2016, https://globalnation.inquirer.net/145812/duterte-tells-us-critics-stop-hypocrisy. 5. Catherine S. Valente, “Duterte favors war games with China,” Manila Times, October 18, 2016, http://www.manilatimes.net/duterte-favors-war-games-china/291850/. 6. “Duterte announces China visit, dismisses Washington as ‘arrogant,’” South China Morning Post, October 11, 2016, http://www.scmp.com/news/china/diplomacy-defence/article/2027108/duterte-announces-china-visit-dismisses-washington. 8. https://www.theguardian.com/world/2016/dec/03/philippines-rodrigo-duterte-donald-trump-white-house-invite. Pia Ranada, “Why has Duterte visited 14 military camps in less than a month,” August 20, 2016, http://www.rappler.com/newsbreak/in-depth/143584-duterte-military-camp-visits-analysis. 9. Rozanna Latiff, “Malaysia’s 1MDB in $1.7 bln asset sale, PM says debut mostly gone,” Reuters, December 31, 2015, http://www.reuters.com/article/malaysia-1mdb-idUSL3N14K11920151231. 10. “China to pour in billions for rail project,” The Star, November 1, 2016, http://www.thestar.com.my/news/nation/2016/11/01/china-to-pour-in-billions-for-rail-project-engineeringandconstruction-contract-will-also-be-signed/. 11. Personal communication, November 2016, Kuala Lumpur. 12. Joseline Tan, “Game changer from China visit,” The Star, November 6, 2016, http://www.thestar.com.my/opinion/columnists/analysis/2016/11/06/game-changer-from-china-visit/. 13. Najib Tun Razak, “Fruits harvested from seeds of trust,” China Daily, November 2, 2016, http://www.chinadaily.com.cn/opinion/2016-11/02/content_27245852.htm. 15. “Malaysian PM aims ‘new heights’ in bilateral relations for China visit,” China Daily, October 31, 2016, http://www.chinadaily.com.cn/world/2016-10/31/content_27222073.htm. 18. “Besieged Malaysian leader vows to cooperate with Beijing in South China Sea, declares purchase of warships,” The Japan Times, November 2, 2016; “China and Malaysia agree on military cooperation in the South China Sea,” The Guardian, November 2, 2016, https://www.theguardian.com/world/2016/nov/02/china-and-malaysia-agree-on-military-cooperation-in-the-south-china-sea. 19. Kuik Cheng-Chwee, “Malaysia between the United States and China: What Do Weaker States’ Hedge Against?” Asian Politics and Policy 8, no. 1 (2016): 155-177. 20. Personal communication with Malaysia-based defense observers, November-December 2016, Kuala Lumpur. 21. Amy Chew, “What has Malaysian leader Najib Razak’s China trip got to do with 1MDB?” South China Morning Post, October 29, 2016, http://www.scmp.com/week-asia/geopolitics/article/2040709/what-has-malaysian-leader-najib-razaks-china-trip-got-do-1mdb. 22. The Edge (Malaysia), November 7-13, 2016; “PM says ECRL to cost RM55b, just shy of Sarawak Report’s claims,” Malaysiakini, October 22, 2016, http://www.malaysiakini.com/news/360023. 23. Anil Netto, “Overdependence? 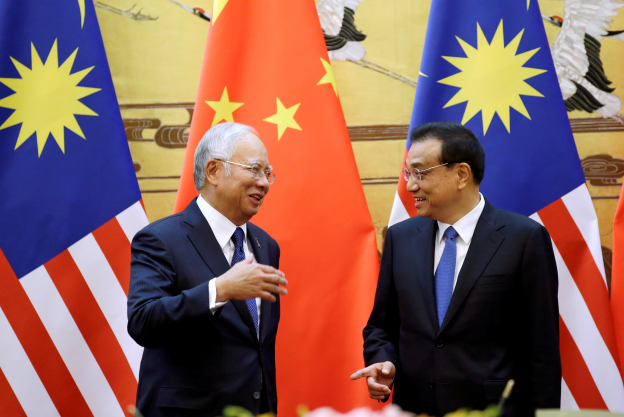 How China is set to change Malaysia’s landscape?” Aliran, November 15, 2016, http://aliran.com/aliran-csi/aliran-csi-2016/overdependence-china-set-change-malaysias-landscape/; Shannon Teoh, “Malacca harbor plan raises questions about China’s strategic aims,” Straits Times, November 14, 2016, http://www.straitstimes.com/asia/se-asia/malacca-harbour-plan-raises-questions-about-chinas-strategic-aims. 24. Joseph Sipalan, “Malaysia’s Najib risks backlash at home after deals with China,” Reuters, November 7, 2016, http://in.reuters.com/article/malaysia-china-idINKBN1320F9. 25. The first author owes thanks to Don Emmerson for the idea of the deference-defiance spectrum. 26. Walter Sim, “ASEAN hedges between Beijing and Tokyo,” Straits Times, November 24, 2016, http://www.straitstimes.com/asia/se-asia/asean-hedges-between-beijing-and-tokyo. 27. Mari Yamaguchi, “Duterte affirms US alliance despite tough talk,” Philippine Star, October 27, 2016, http://www.philstar.com/headlines/2016/10/27/1637862/duterte-affirms-us-alliance-despite-tough-talk. 28. Personal communication with Malaysia-based defense observers, November-December 2016, Kuala Lumpur. 29. “Philippines’ Duterte says trusts Trump to be fair on immigration,” Channel News Asia, November 16, 2016, http://www.channelnewsasia.com/news/asiapacific/philippines-duterte-says-trusts-trump-to-be-fair-on-immigration/3293010.html?cid=fbcna. 30. “Najib phone Trump to reconnect ties,” The Malay Mail Online, November 27, 2016, http://www.themalaymailonline.com/malaysia/article/after-long-silence-najib-phones-trump-to-reconnect-ties. 31. Nectar Gan, “The who, what, when, where and why of Philippine President Rodrigo Duterte’s trip to China,” South China Morning Post, October 18, 2016, http://www.scmp.com/news/china/diplomacy-defence/article/2028862/who-what-when-where-and-why-philippine-presiden. 32. Tom Phillips, “Rodrigo Duterte arrivs in China with ‘make friends, not war’ message,” The Guardian, October 18, 2016, https://www.theguardian.com/world/2016/oct/18/rodrigo-duterte-philippines-president-china-make-friends-not-war. 33. “China and Malaysia agree on military cooperation in the South China Sea,” The Guardian, November 2, 2016, https://www.theguardian.com/world/2016/nov/02/china-and-malaysia-agree-on-military-cooperation-in-the-south-china-sea. 34. Kuik Cheng-Chwee, “Malaysia’s South China Sea Policy: Optimizing Elite’s Multiple Interests Under Uncertainty,” forthcoming. 35. Alice D. Ba and Kuik Cheng-Chwee, “A Recurrent History with New Twists: The Structure and Processes of Southeast Asia’s Relations with China,” in Contemporary Southeast Asia (3rd edition), ed. Alice D. Ba and Mark Beeson(New York: Palgrave Macmillan, forthcoming). 37. Jane Perlez, “In China, Rodrigo Duterte and Philippines may ‘pivot’ away from US,” New York Times, October 17, 2016, http://www.nytimes.com/2016/10/18/world/asia/rodrigo-duterte-philippines-china-us.html?_r=0. http://cnnphilippines.com/news/2016/09/15/hedging-rodrigo-dutertes-diplomatic-balancing-act.html. We thank Aries Arugay for drawing our attention to this material. 39. Kuik Cheng-Chwee and Gilbert Rozman, “Light or Heavy Hedging: Positioning between China and the United States,” in Joint US-Korean Academic Studies 2015. Facing Reality in East Asia: Tough Decisions on Competition and Cooperation, ed. Gilbert Rozman (Washington, DC: Korea Economic Institute, 2015), 1-9. 40. Kuik Cheng-Chwee, “How Do Weaker States Hedge: Unpacking ASEAN States’ Alignment Behavior towards China,” Journal of Contemporary China 25 (2016): 500-514; Kuik Cheng-Chwee, “Malaysia’s balancing act,” The International New York Times, December 7, 2015, 8. 42. Personal communication with author, November 2016, Kuala Lumpur.